Do you sometimes wonder about your little one? Where do his ideas come from? He's either coming up with outlandish stories with unpredictable twists and turns with strange nonsequiturs or he's just asking one word, " Why?" Or maybe he'll slip in an occasional "How?" in there somewhere. Talking with him is like boarding a conversational airplane without knowing where you're going. You've just got to sit back, relax, and enjoy the ride. You know, there's a place he would fit right in. There's a table in front of a house in Wonderland, yes, the one that Alice showed up at. At this table, it's tea time all the time simply because the March Hare's watch stopped. We think your kiddo would like this party, it's all about storytelling. Sure, the stories don't necessarily make sense, it just usually just folds into itself but we think your kiddo would probably be into that. Whether or not he likes the taste of Earl Grey, he'll enjoy making friends with the tired little dormouse and the slightly spastic March Hare. 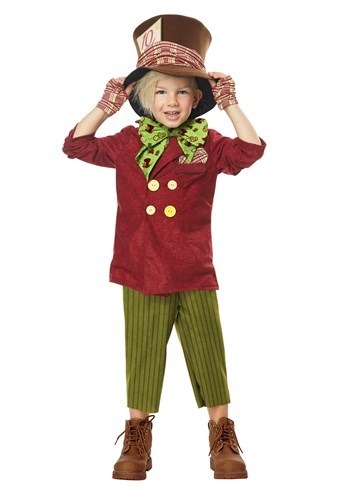 He'll be ready for Wonderland in this adorable ensemble. The striped red and green pants coordinate with the oversized bow tie that has printed timepieces. He'll be cozy trick-or-treating in the red jacket and fingerless gloves. The ensemble is polished off with an big top hat wrapped in plaid fabric that matches the gloves and kerchief. It's the perfect outfit to pilot an all new conversational trip, now that he's friends with the March Hare, who knows where you guys will go?